London - Olympic silver medallist in the women's 800m, Caster Semenya, says she will put all her efforts over the next four years into winning gold at the 2016 Olympic Games in Rio de Janeiro. Semenya won South Africa's sixth medal at the London Games, finishing second behind Russia's Mariya Savinova. "I am happy with a silver medal in my first Olympics," said Semenya. "Now, I just have to concentrate to win the next Olympics. "Four years is not easy, but I'll just have to go back and concentrate, so that I can do it again." The 21-year-old said she was disappointed that she had left her attack too late in the race. She held back until the final 200m with Savinova well ahead of her. When Semenya kicked, with 70m to go, Savinova already had a sizeable lead and the South African unable to catch her. "I knew I had a better kick but, unfortunately, I made a late move but I am very happy with the silver medal," she said. "I tried hard to get back there but the body wasn't really on fire today, and I had to fight until the end." Before the Olympics in the English capital, Semenya only managed to dip below two minutes on two occasions. However, she produced peak performances at these Games, running a season's best time of one minute, 57.23 seconds (1:57.23) on Saturday night. "I haven't had such a good season, compared to the previous two seasons, but we are getting there and I can see I am improving," Semenya said. "We are getting to the normal shape and 1:57 is a good time. "It is a season's best, so I am very happy and I am just looking forward to finishing my season well." The Limpopo-born athlete said she initially found it hard to adapt to Maria Mutola's coaching methods. "I had a rough season training-wise... four weeks before the championships things started to get okay," she said. "Changing coaches can maybe affect your performance because the body has to adapt to what you are doing. "I am happy I peaked at just the right time." Mutola said she was disappointed with Semenya's race and was confident she could have taken pole position. "We've been working on her finish for the past four weeks," Mutola said. "Her finish is better than anyone else's, at the moment, in 800m in the world, I believe. "I wasn't surprised when we came here and she ran those times because I knew from training that Caster could do better, even 1:55, this year and she's in shape to do that." 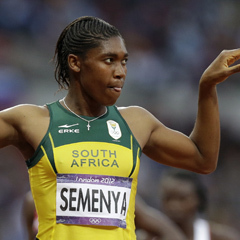 Semenya said she had put the 2009 gender testing debacle behind her and would let Mutola guide her to greater heights. "I see a pretty good future for me now," Semenya said. "The most important thing is just to train and listen to my coach and, as she said, focus on my career and forget about the past. "Now we concentrate on the future. "I am happy with the silver ... the plan was to win the gold but I am happy because it is my first Olympics." She said she still had a lot to achieve but felt she was following in her mentor's footsteps. "It is a really good start and I am still a little bit young and I am growing," she said. "I just have to train hard and I will achieve more."